London. — (UP) Dispatches from the Russian front indicated today that Soviet cavalry divisions have killed 9,000 of the enemy in nine days. In heavy fighting on the Kalinin front, the streets of the village were left littered with the bodies of 900 Nazi dead, a Russian communiqué said. While arriving spring slowed infantry, it enlarged the battle in the air. The Soviet communiqué said the Germans had lost 322 planes between April 5 and 11, and 1,103 from March 11 to April 11. From April 5 to April 11, the Russians lost sixty-seven aircraft; from March 11 to April 11, they lost 314. London. — (UP) One of the most important battles of the war, for Russia's important port of Murmansk, appeared to be developing today as Soviet forces pushed the Germans back around Leningrad and through the suburbs of Stalino in the far south. Well-informed London quarters said German air attacks on Murmansk probably were the start of a land, sea, and air drive against it. In recent weeks, deliveries of American lend-lease supplies to Murmansk, Arkhangelsk, and other far northern ports have increased to such an extent that the Germans are believed to be highly alarmed. In regards to the Soviet offensive, radio Moscow reported that after two days of heavy fighting the Russians had advanced eight miles along the Leningrad front and thrown the Germans out of four more populated places. Around Staraya Russa the Russians were reported annihilating what was left of the encircled German 16th army with big guns and bombing planes. Marshal Semyon Timoshenko's forces were said to be pushing the Germans through the suburbs of Stalino into the heart of the city, while heavy artillery shelled German supply lines west of Stalino. There was evidence that the Russians had their own plans for an Arctic offensive. London. 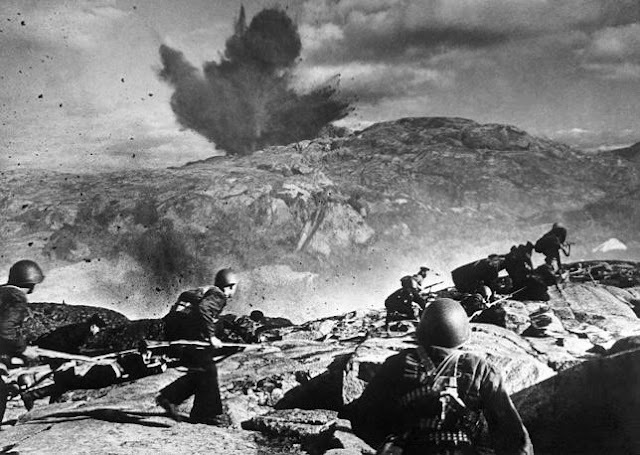 — (UP) A Russian surprise attack 220 miles north of the Arctic Circle was believed today to have dashed German plans for a spring offensive against Murmansk at the moment they were to have been executed. Soviet shock troops, landed behind the German lines in a spectacular land, sea, and air operation, were fighting fiercely along the Gulf of Motovski near the Rybachiy Peninsula off the northwestern coast of Russia, the London News Chronicle reported from Stockholm. The German mass air attack on Murmansk Wednesday was understood to have been the tip-off to the Russians that the Germans were ready to begin their offensive to cut the Barents Sea route for Allied supplies. German preparations for the attack included the concentration of picked paratroops, at least part of whom had taken part in the capture of Crete. The first phase of the German attack, it was understood, was to have been the gaining of air superiority over Murmansk. It failed because the Russians knocked down thirteen of their planes in one day. Immediately the Russians began their own offensive. They set out into the Arctic in warships, Stockholm dispatches said, and under an umbrella of Stormovik bombers and British Hurricane fighter planes, tore into the rear of the German lines, catching the enemy by surprise, blowing up ammunition dumps and bridges and creating general havoc.